Note: Maps and information below is from the CDC. Map 1: States reporting laboratory-positive West Nile virus infection in birds, mosquitoes, animals, or humans during 2002. Map 2: States reporting confirmed West Nile virus infection in birds, mosquitoes, animals, or humans, 1999-2001. Note: The data presented reflect public reports by state and local health departments. 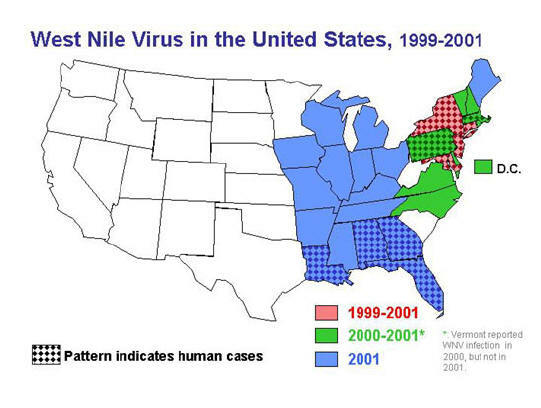 Map 3: Spread of West Nile virus by state, 1999-2002. West Nile Virus Activity in the U.S. in Birds, Horses, Mosquitoes, Animals, or Humans. Send mail to ChrisJWallace@aol.com with questions or comments about this web site. Lorain County Community College -- Last modified: 04/18/03 -- Don't click here.